Have you ever thought about how music works in a sequence of shots the way a colourist thinks of how colours work in a sequence of shots? It’s okay if you haven’t. Most video editors/colourists probably haven’t either. The goal here is to give you a unique perspective on the relationship between music and colour. I'm hoping is that it will be a new perspective that bridges the gap between visual and audio, resulting in your projects consistently being taken to a new level of cohesion. A unique process to make searching for music more effective. Speaking in terms of colours can help to communicate ideas about music. Use colour theory to reason and help backup your music choices in creative meeting situations. To assist in strengthening the continuity between music and picture. I can relate to this quote because that’s what music supervisors are trying to do, but instead with musical tones rather than visual colours. At the time I had no idea what that was! But she explained to my class that many types of synesthesia exist and that she had sound-to-colour synesthesia aka ‘Chromesthesia.' The ability to see visualizations of sound as angulating colours. You may have even been born as a synesthete! Theory says we are all born as synesthetes but are abilities vanish as we age. About 1 in 3,000 individuals will retain synesthete ability. The good news is that this post should still be helpful to you even if you don’t possess synesthete powers. As visual creatures, we tend to do most of our communicating through non-verbal means of communication (i.e. body language), including reading the tone of colour, based on thousands and thousands of years of lizard brain primitive instinct. Orange and red could mean something dangerous like a fire or light blue could mean something nice like clear skies. The psychology of colour leaves no question as to why we have the job of a colourist in the post-production world of video. Directors and DOP’s work with colourists to achieve this same kind of effect in their work. Here’s a great explainer video on the main differences between colour correction and colour grading. Before we can bring music into the picture, we need to understand some basic colour theory and how it works with the human psyche. The internet is full of great resources for reference when working on the colour grades of your video. I like this colour wheel of emotions. It has been a useful reference for me when analyzing the colour theory of a video clip. With this in mind, we can now look at some examples of colour in film. Check out this awesome reel by The Verge on the typical colour grading schemes we most commonly see in Hollywood movies. Both colour and music have overlapping qualities and seeing as our emotional responses to colour are well-documented it should be no secret as to music effortlessly striking our emotional chords. So, as a non-chrome synesthete how do we recognize the colour within a piece of music? We want to be able to hear these colours to form a perfect marriage between the visual colours on screen and the auditory colours coming from the speakers. More good news, it’s much easier than you may think and you’re probably doing it already! The trick here is to shift your thinking so that you are not over-thinking and blocking the creative process. Firstly, I would begin by first watching your scene and assessing the mood. Then apply your colour grading to paint an accurate picture of the mood happening on screen. These instinctual reactions are the basis for how we assign colour to music. Once the overall mood is determined listen to how the song is written. What are the different instruments doing? Is there a lot of instruments playing at once? or is it sparse? Is the tempo fast or slow? Referring to the colour wheel above we can start to narrow in on the appropriate colours/moods for a piece of music. I have carefully picked two colourful songs from the Bedtracks library. One in the major key and one in the minor key. 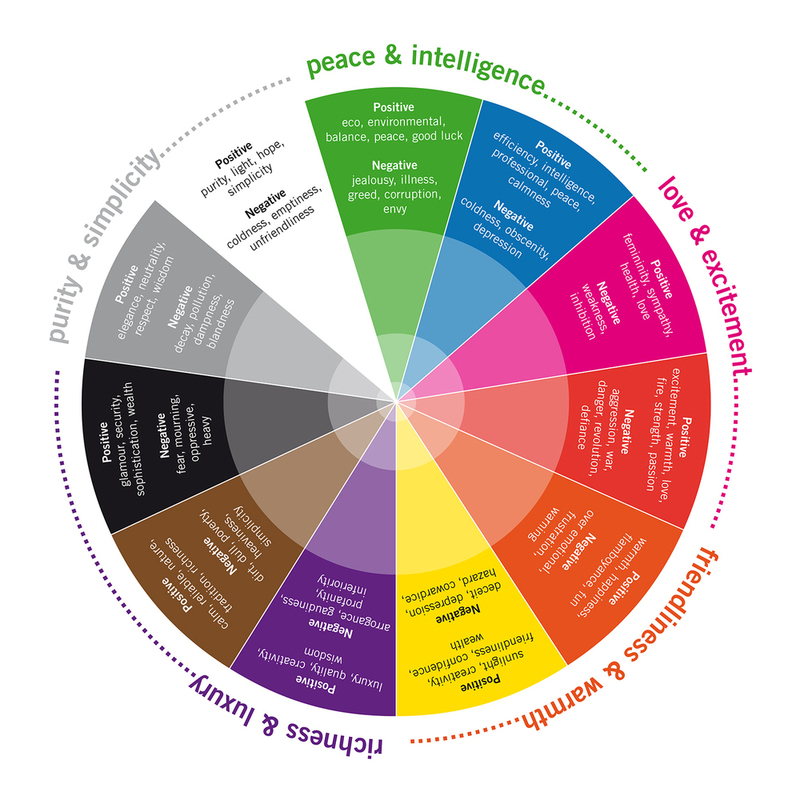 Take a listen to the track while looking at your colour theory wheel of feelings. Write down the corresponding colour for each feeling you get as you listen to the song. I aim for about three colours per song, but it ultimately depends on the music. Now here’s a test done on four radically different pieces of music. (Source; Every Song Has A Colour - And An Emotion - Attached To It). With this approach in mind, we can analyze the colour grading of the following clips and the colorations in musical accompaniment. I love this example because of its wide range of colour variety and vibrancy. Of course, this is a highly subjective exercise, but from my perspective the first colour that made itself apparent was black. It represented a fearful and ominous mood that the music reflected in a down-trodden sort of whomp-whomp gloominess. The colour blue isn’t used, but in the overall mood, I felt the viewer was made to feel slightly depressed by the un-wellness of the banana. We see as the ad progresses the colour of the banana changes from a blackish, brown to a bright yellow. The yellow says health, friendliness and creativity and the music pivots perfectly into an enthusiastic yellow and orange vibrancy in tone. The music becomes bright, positive, and happy. A very creative use of music and sound design to complement an unusually simple yet very creative advertising spot! I was watching episodes from the latest season of House Of Cards this week, and it hit me during the opening credits just how moody the colours and theme music are. To me, the music and colour grading work well together and do a great job of emphasizing the dark and unscrupulous drama of House Of Cards. I immediately felt like the most prominent colour was a cold blue. Musically, I heard this brisk, loneliness coming from the horns. Fear comes in from the military marching style drumming, which I associate with the predominant use of dark colours in the shadows. Lastly, I noticed the use of white in contrast to the heavy use of dark colours. The white is most evident in the lights during the night time sequences. The white lights portray a purity and unfriendliness although simultaneously creates an eerie sense of hope like the beacon of a lighthouse. I believe the strings deliver an enormous amount of the mood in the theme and the double basses are where I am registering a tense unfriendliness. The trumpets make a subtle nudge towards hope at 1:13. Let’s end on a bright note. I thought this was a lovely example of light and vibrant colours in both the music and colour grading. Notice how the grading makes you feel positivity and warmth. I feel a saturated friendliness and sense of peace when watching. The colour green dominants the colour scheme of the spot, which says peace, balance, and money (it’s a bank after all). The overall mood of the music has a sophisticated confidence (Blue/professional). I hear the sophistication in the string arrangement, and the confidence comes from the driving drums. It is hopeful (white). I hear hopefulness in the movement of the strings and building dynamics. Finally, I hear a peaceful, lightness in the textural sounds like the sparse piano and pizzicato strings. Colour theory in music, like most concepts in art is highly subjective. Although not everyone will agree with the colour associations of another individual I believe the process covered in this post can assist creatives in their video production projects. Rather than seeing video and music as separate entities, I think it will be useful to see how they are similar and exploit those similarities. Determine the emotional tone of the scene and then apply your colour grading accordingly. Jot down a couple of dominant colours from your scene while on your music search. As you audition music in your video, try to pick out the different colours in the music. Typically, I hear low tones as being a darker colour and high pitches as brighter and vibrant. How does the mood of the song fit the mood of your scene? I would love to hear from you on your experiences with sound and colour! Please share your perspective on the relationship between music and colour in the comments below.